Oh I really love this series. 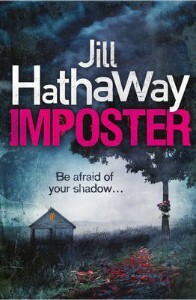 There's just something about both Slide and this sequel, Imposter by Jill Hathaway that just gets to me. I love the premise of it which is has strong elements of the creepy. But I also love the mysteries that come up, the secrets that need to be unearthed. And oh, especially the relationships between the characters! Not just Vee and Rollins but Vee and her sister and her dad and also Vee with her ex-best friend Samantha. I really love Vee Bell as a main character with all the mistakes she makes and how she feels so isolated and out of control in Imposter. She's been having these dreams in which she experiences her first love dying again and again. And that would be pretty bad all on its own, only Vee wakes up and she's not in her bed anymore and she doesn't know what just happened or how she got there. Instead of Vee sliding into someone else's body ... somebody is sliding into Vee's. But who and for what purpose? It had been awhile since I read the first book, Slide, and I did worry that too much time had passed and I would feel lost reading Imposter but it wasn't so. I picked up the story really quickly and quite easily fell back into Vee's head. A lot is going on for her and my heart really went out to her. Not only does she have to figure out what is going on with her sliding abilities and who might be causing the strange things around her but she's also had to confront her growing feelings for her best friend and she's got an estranged aunt who is back on the scene. Vee is not entirely sure that Rollins still feels the same way about her as he did several months ago, especially after spending a great deal of time with his beautiful and cool co-worker, Anna. And she has her doubts as to why suddenly Aunt Lydia has shown up on her doorstep. Imposter was a really quick read for me. The fast-pace of the book together with the ramped-up tension (both romantic and otherwise) made it impossible for me to not read the book in as few sittings as I could. This book has such an amazing cast of characters, a terrifying premise, great relationships and mystery and suspence all crammed into a fairly small amount of space. I absolutely adore this series and I cannot wait to see what will happen next. Great review. I loved SLIDE, and I have this, so I'm really looking forward to reading it!